In September of 2018 we did a short trip to the Paria River Canyon. Since September is considered a “monsoon season” in Southern Utah, we had the Canyon to ourselves (not counting snakes). The area is absolutely spectacular and the feel of remoteness adds to the sense of adventure. 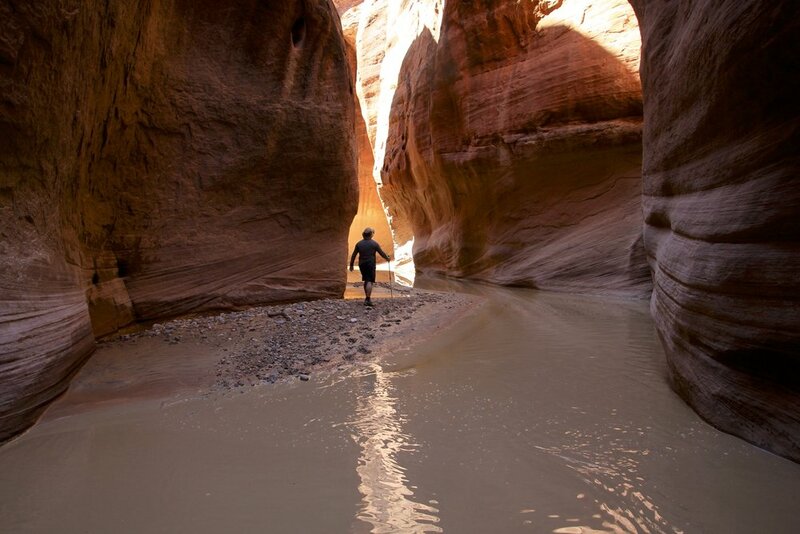 The entire Paria Canyon crossing is 34 miles long. 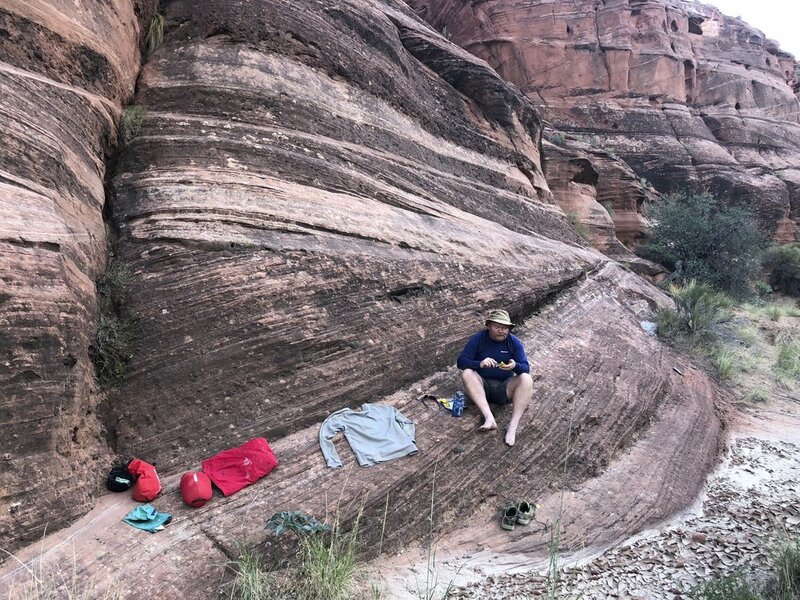 Since we had limited amount of time, we hiked to the Paria River and Buckskin Gulch confluence from the Whitehouse campground (12 miles) and back. It really gave us a sense of what the entire crossing would be like. Since the river is very silty, water is a major concern. We carried 5 litres each. Since it is very hot, 5 lites is good for max 2 days. The nearest spring is 13 to 14 miles from the start. 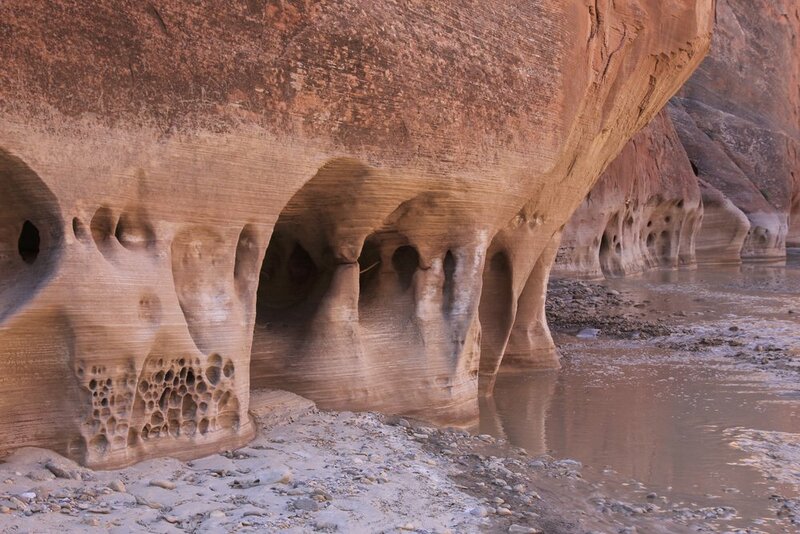 Because of the massive flooding in the summer of 2018, parts of the Canyon were completely submerged and dotted with deep water holes. This forced us to swim across long stretches in some spots. In other places, the water was up to our armpits but walkable. After the hike, everything was covered in filmy mud that required serious scrubbing with soap to wash off. Thankfully, we did not get caught in any quick sand. We encountered MUD and a lot of it! Caverns made by rushing Paria River. When we were there, the river was running at 2 cubic feet per second. We encountered a small flash flood and the river flow increased to 9 cubic feet per second. It was already hard to swim against the current and our packs got washed away. During the severe flooding in July of 2018, the river was punching 10,000 cubic feet per second!!!! Wow! The sun bakes the soil. It was very hot in the sun. Our campsite on the banks of the Paria River. 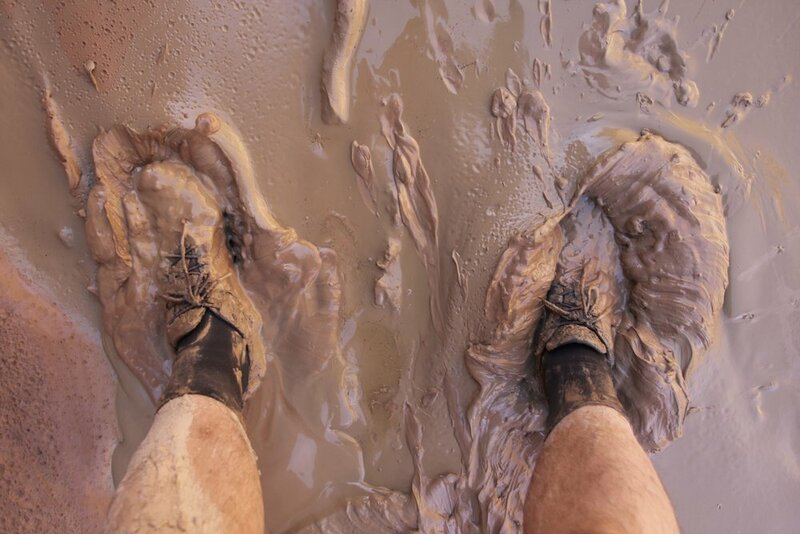 Preparing to swim through a deep pool of liquid mud. I did not realize that there were snakes in the water! One got logged inside the pack after it was washed away by the river during a small flash flood. Exploring the Paria Canyon. We left our packs behind and during our exploration the river flow quadrupled. The packs got washed away. We found them downstream from where we left them. One of them had a snake stuck in it. When the river is flowing high, the snakes flow with it :-). After our hike, we received a lecture from a local on the types of snakes in the canyon. Apparently, the bad one has eyes of a cat. It is hard to check when you are freaking out after finding one in your pack!